Portion sizes at U.S. fast food restaurants have remained nearly constant for almost two decades, according to an ARS study. gricultural Research Service (ARS)-funded scientists investigated trends in portion sizes and the calorie, sodium, saturated fat and transfat content of popular meal combos at U.S. quick-serve chain restaurants. They found little change in portion sizes during an 18-year period. On a positive note, the study recorded a decline in trans fat content of French fries during the study period. The study was led by nutritional biochemist Alice H. Lichtenstein and colleagues. She is with the U.S. Department of Agriculture's ARS Jean Mayer USDA Human Nutrition Research Center on Aging at Tufts University in Boston, Massachusetts. 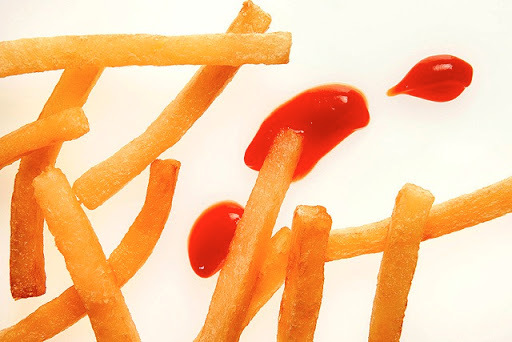 The team gathered data on 27 common food items served from three quick-serve chains, commonly called "fast food" restaurants, between 1996 and 2013. They also examined the classic bundled meal of fries, cola and a burger. The researchers reported that overall they did not find changes in product portion sizes-as assessed using total calories-or in product reformulation by the restaurants to become consistent with the 2010 Dietary Guidelines for Americans. Called the "DGAs," these guidelines encourage consumers to reduce intakes of sodium and saturated fat. The DGAs provide science-based advice about how dietary habits can promote health and reduce risk of major chronic diseases.